The benefit tenants receive from subsidised rents (IRR/IRRS) [Income related rent subsidy] is (on the whole) significantly greater than the benefit received by people who get the Accommodation Supplement (AS) - creating pressure on public housing places. 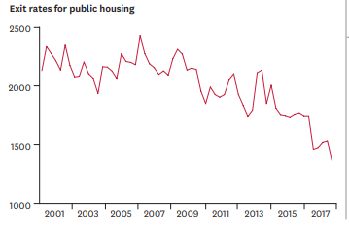 Exits from social housing are decreasing rapidly. So part of the housing 'crisis' - the shortage specifically - is the result of the normal flow in and out of state houses becoming disrupted as market rents rise. State housing is about provision of homes for the neediest, hopefully as a temporary state of affairs, because the housing stock hasn't grown for decades. That can't happen if current occupants batten down. Every move the government makes that impinges on the private housing market eg land restriction and bureaucratic interference on many more levels, comes back to bite them at the social housing end. Now instead of reversing restrictions and bureaucracy they plan to increase the supply of state houses and have increased the accommodation supplement. It's just not a viable solution. Did you know that beneficiaries who cannot afford their market rent are routinely told,"you can get a boarder"? This of course assumes there is room and the landlord doesn't object. Not so those in social housing.